Visits: 43138 persons viewed this recipe. 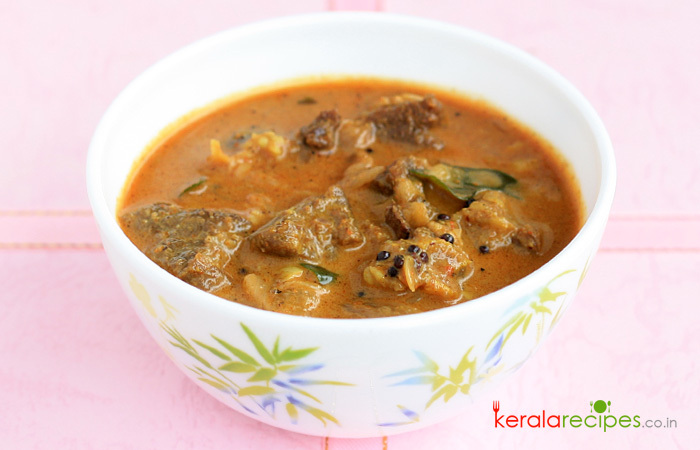 Kerala beef curry is an all-time favorite of Christians in Kerala. For them, Easter and Christmas wouldn’t be complete without beef dishes. It’s an all-rounder dish which can be served for breakfast, lunch and dinner. Here I am going to do a coconut-milk based Kerala beef curry. Hope you will like it. Cut beef into small pieces, wash and drain it. Heat coriander powder and chilli powder in a frying pan on a low flame. Pressure cook beef along with half of roasted powders (step 2), ½ tea spoon of turmeric powder and salt. Slice shallots and chop ginger & garlic. Heat 3 table spoon of coconut oil in a cooking pan and put mustard seeds. When the mustard seeds begin to sputter, reduce the flame to medium. Put garlic, ginger and shallots one by one and saute it. When it turns golden brown, add remaining roasted powders (step 2) and 1 table spoon of meat masala. Stir it for 1 minute. To this, add cooked beef along with the gravy and mix it well. Add curry leaves and boil it for few minutes. Now, reduce the flame and pour coconut milk into it. Combine it well and remove from the flame before it starts boiling. (Take care not to overheat it after adding coconut milk). Taste for salt. Kerala beef curry is ready for serving. Transfer to the serving dish. Curry was awesome…… thanks to kerala recipes….. Thank you very much for the recipes. Very useful, especially for the people like us who stay abroad. You are welcome Thomas. It is pleasure to know that this place is very useful to people like you. Hope to see you here often. I am new to cooking and I like cooking.. I enjoyed your recipes and I leave u a question is use of coconut milk in beef curry. Fabir, Thanks for the feedback. Glad you liked my recipes. There is absolutely no problem in adding coconut milk in Kerala beef curry. If you want you can exclude it. Super and want to know how to prepare beef intestine.. pls give me a idea. Praveen, Thanks for the feedback. Actually I haven’t tried beef intestine recipe. I think it will work out if you follow the methods of beef roast recipe. Bernardete, Meat masala is a ready made spices mix used for meat preparations. It will be available in most of the Indian stores around the globe. Does this recipe need 25 shallots? I think I’m reading it wrong- help! And is it better served with rice or a flat bread? Thank you!! Laura, You can use 10 to 25 shallots in this beef preparation. Adding more shallots make it more tasty. The beef curry can be served with rice, flat bread and Indian dishes like appam, pathiri, chapathi, porota, kuboos, gee rice etc. Hope it will work out well for you. Thank you very much for the questions. Thank u Shaan for this recipe. It’s very simple and tasty. Thanks for recipe Shaan. I always err on the side of adding water when using pressure cooker. Partially to do with being cautious. When using lean meat, how much water should I add to the pressure cooker? Slam, the meat itself contains water. When you start heating it will come out. So no need to add water while pressure cooking it. If you want you can add a little water for the safer side. I tried your chicken curry, it was outstanding. SUPER MACHA SUPER. I like it both you and your recipes. Thanks a lot.